* 1. In the diagram below (Figure 3), the location of several natural environments is given. Assign each one to the appropriate letter: organic-rich saline waters, water-logged soils, aerated saline waters, mine waters. (Note: The dotted lines represent water equilibria). Figure 3. The location of several natural environments in a Pourbaix diagram. with a standard potential of £'0aq (see Napoli, 1997 and Ibanez, 1988), the line that governs such equilibrium is independent of pH and a portion of it is given in Figure 4. 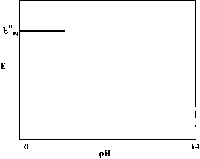 Assuming that MLm+ is more stable than ML(m~")+, and that L does not participate in acid-base nor hydrolysis equilibria, which of the options in Figure 5 represents this new equilibrium? FIGURE 4. The equilibrium line between Mm+ and M(m-n)+ represented by Mm+ + ne = M!m with a standard potential = £°aq. FIGURE 5. E-pH response of a metal ion upon complexation. *3. Sketch the predominance-zone diagram for the Cu2+/Cu(OH)2/CuC>2- system using the conditions and equilibrium data from Problem 2 in the Prelab-oratory questions and problems. 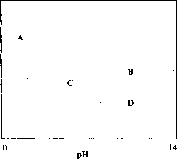 Barnum, D. W. "Potential-pH Diagrams," J. Chem. Educ. 1982,59, 809-812. Campbell, J. A.; Whiteker, R. A. 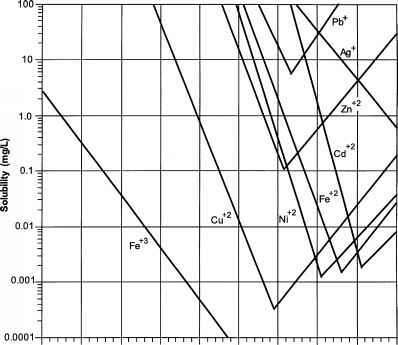 "A Periodic Table Based on Potential-pH Diagrams," J. Chem. Educ. 1969,46, 90-92. 60, FIN-28101, Pori, Finland. Ibanez, J. G. "Redox Chemistry and the Aquatic Environment: Examples and Microscale Experiments," Chem. Educ. Int. (IUPAC) 2005, 6, 1-7. Ibanez, J. G.; Garcia, K.; Balderas-Hernandez, P. "Microscale Environmental Chemistry, Part 4. Experimental Transitions in a Potential vs. pH or Pourbaix Diagram," Chem. Educator 2005,10, 348-351. Ibanez, J. G.; González, I.; Cárdenas, M. A. "The Effect of Complex Formation upon the Redox Potentials of Metallic Ions," J. Chem. Educ. 1988, 65, 173-175. King, D. W. "A General Approach for Calculating Specia-tion and Poising Capacity of Redox Systems with Multiple Oxidation States: Application to Redox Titrations and the Generation of pe-pH Diagrams," J. Chem. Educ. 2002, 79,1135-1140. Little, J. A. University of Cambridge, http://www.msm. cam.ac.uk/jal/C8-4/C8-4-1 .htm. 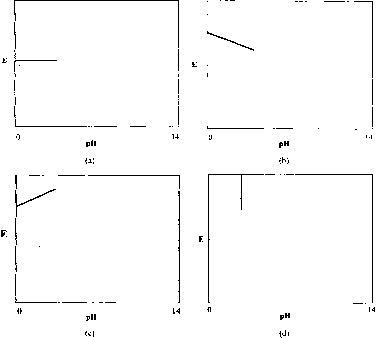 Napoli, A.; Pogliani, L. "Potential-pH diagrams," Educ. Chem. March 1997, 51-52. Pourbaix, M.Atlas of Electrochemical Equilibria in Aqueous Solutions, 2nd English ed. ; National Association of Corrosion Engineers: Houston and CEBELCOR, Brussels. 1974. Powell, D.; Cortez, J.; Mellon, E. K. "A Laboratory Exercise Introducing Students to the Pourbaix Diagram for Cobalt," J. Chem. Educ. 1987,64,165-167. Singh, M. M.; Szafran, Z.; Pike, R. M. "Microscale and Selected Macroscale Experiments for General and Advanced General Chemistry: An Innovative Approach," Wiley: NY, 1995. Chapter 7. Tykodi, R. J. "In Praise of Copper," J. Chem. Educ. 1991, 68,106-109. Williams, B. G.; Patrick, W. H. Jr. "A Computer Method for the Construction of E/i-pH Diagrams," J. Chem. Educ. 1977, 54, 107.